Access resources with a Columbia Gorge Community College (CGCC) library card. Currently registered CGCC students can come into the library on The Dalles campus or the front desk of the Hood River Campus and get their picture taken for a combination Student ID card and library barcode number. If you are a distance student and unable to come to either The Dalles Campus or Hood River Campus, please fill out this library card request form. Library card holders are subject to our fines policy. 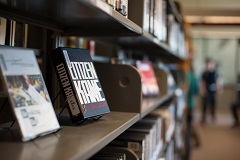 Public patrons are welcome to use our library; you do not need a CGCC library card. You can use a public library card from Hood River or The Dalles, or you can ask for a guest pass. We try to answer your request within one business day. Just want to ask a question? Please use our contact form instead.